Can you believe it? For the eleventh year in a row, our mission station is being honored by the prestigious Gabriel Radio Station of the Year Award. KNOM is the only small station to ever receive this honor. We thank you most sincerely for making our award-winning work possible. The Gabriel ceremony will be at the Directors Guild of America in Los Angeles on October 20th. We would be delighted if you could join general manager Ric Schmidt at the event. If you can, please send Ric a check made out to “Catholic Academy” in the amount of $65 per person. The cutoff date for tickets is October 6th. Again, thank you for supporting our work, financially and by prayer! WELCOME: (left) Meet new volunteer Ross Reilly, who hails from Roxborough and King of Prussia, PA.
A music and communications graduate of the University of Pittsburgh, Ross worked at Pitt’s college station. Thanks to that experience, he was able to take on morning show duties, and he’ll also serve as music director. Welcome, Ross! Fortunately, there were no serious injuries, and Jesse was able to report from the village, in part thanks to a satellite phone provided by a fellow Nome EMT. Back at the station, news director Paul Korchin and public affairs director Amy Flaherty worked on the story from different angles. Hooper Bay is in the heart of KNOM country, and villagers expressed gratitude for KNOM’s presence during their crisis. (There has been an outpouring of support from across Alaska. 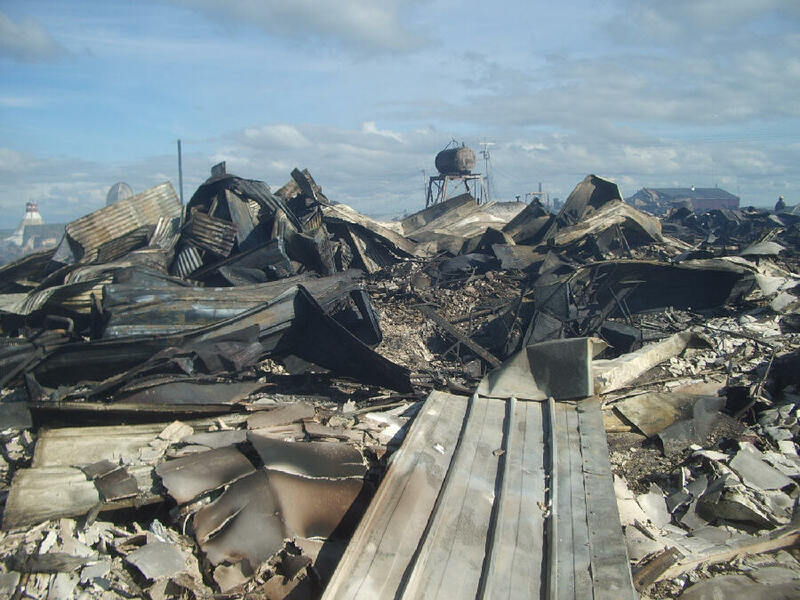 Jesse’s been told that those who lost homes have been provided everything they need for the moment.) KNOM news continues to chronicle the village’s recovery. INSPIRATIONAL SPOT: In tribulation, immediately draw close to God with confidence. You will receive strength and enlightenment. INSPIRATIONAL SPOT: Any simple task or simple chore done in the Name of Jesus can be a great dance of love. 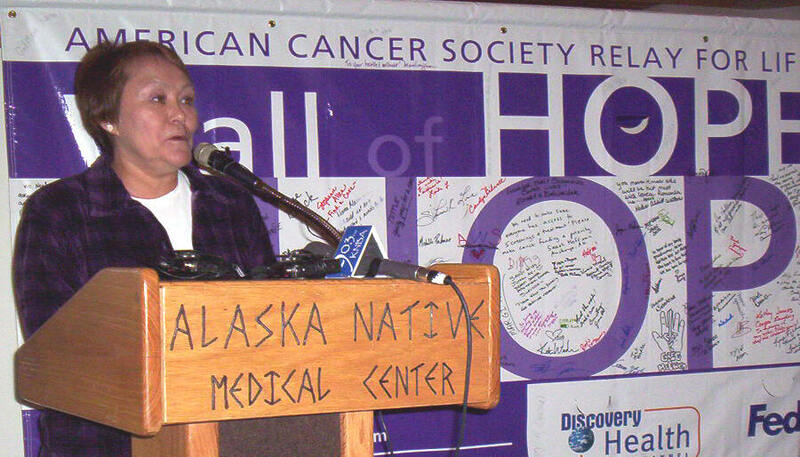 SPEAKING OUT: (left) Former KNOM business manager Florence Busch speaks at a ceremony in the Alaska Native Medical Center in Anchorage. The occasion was Alaska Governor Frank Murkowski signing a bill requiring insurance companies to pay for colonoscopies. (Left) Florence stands in the rotunda of the medical center shortly before the ceremony. 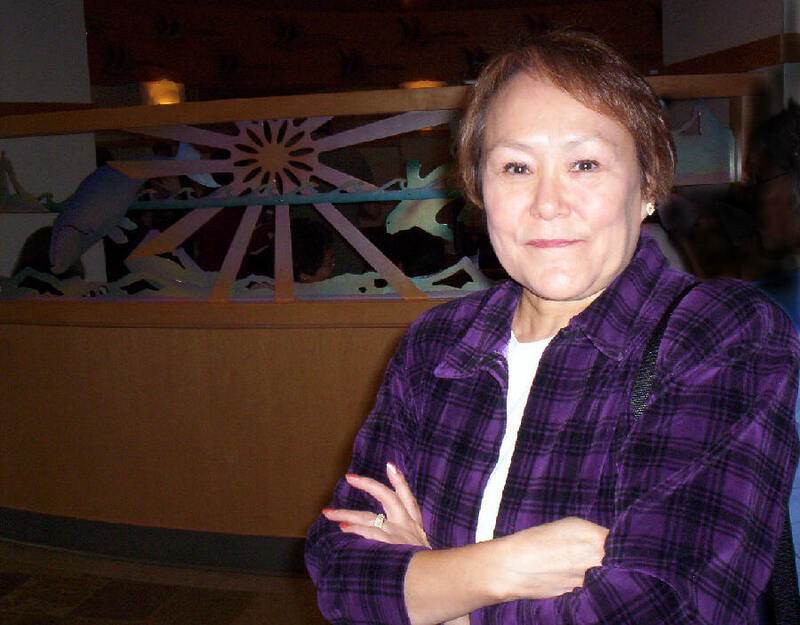 The reasons are unknown, but the incidence of colon cancer among Alaska Native women is the highest of any group in the United States. Florence, for whom a colonoscopy in February detected a fairly advanced cancer, is now free of the disease. She described the experience and urged everyone to have the procedure. First at KNOM as a volunteer announcer and secretary in 1975, Florence was the mission’s business manager for 16 years. Her more than 20 years of service rank her as KNOM’s 2nd longest worker, after husband Tom’s 33. The couple now live in Anchorage. 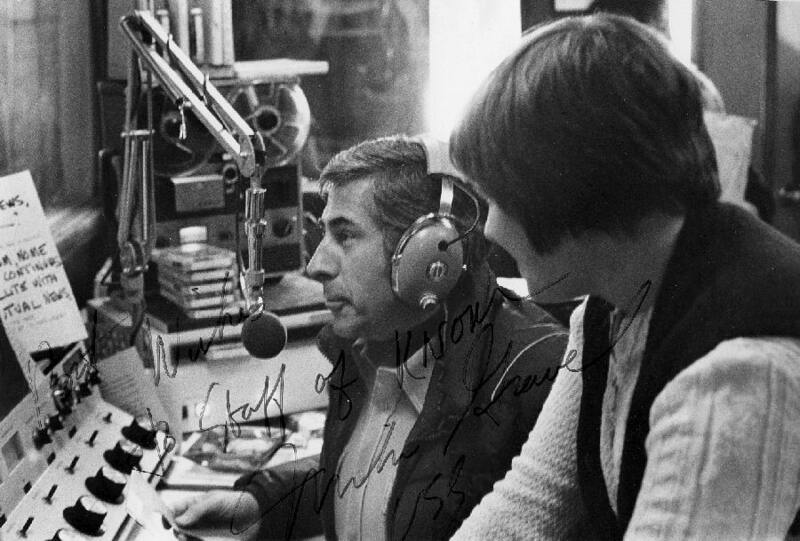 LES TO THE RESCUE: Phone messages were flying around Alaska at the time of the bill signing, as KNOM’s AM signal began breaking up. With Tom, the station’s emergency engineer, out of touch, Lynette Schmidt called former chief engineer Les Brown, who was able to troubleshoot the problem over the telephone, and patch things up via long distance. YIPPEE! There’s great news from office assistant Robyn Woyte. She’s expecting a girl, just before Christmas! Robyn’s husband, Major John Woyte, is scheduled to return from a tour of duty in Iraq shortly before the due date. THE PITS: In late summer, KNOM reported the discovery of a traditional Eskimo pit home at a construction site at the Nome port. It’s the third house pit discovered there, and was undergoing a thorough archaeological examination. Traditional homes were dug into the ground for warmth, and covered with tundra moss supported by driftwood. It’s possible that these homes were seasonal camps. So far, they’ve yielded dozens of artifacts, such as a wooden spoon, tool handles, harpoons and carvings of ivory, and are believed to be more than 250 years old. The oldest Catholic radio station in the United States, we bring Catholic teaching and Catholic liturgy and prayers such as the Rosary to remote villages which rarely see a priest. We strive to keep people throughout 100,000 square miles informed about important events and issues. We serve as a voice for them. And we broadcast vast amounts of practical education that can lead them in directions that will help them improve their lives. Our only source of income is good people like you. INSPIRATIONAL SPOT: A chip on the shoulder can be a heavy burden. Forgiveness can lighten the load. THIRTY YEARS AGO: (left) U.S. Senator Mike Gravel (gruh-VELL) plays guest deejay during volunteer Jeanne Gabriel’s popular afternoon program. Gravel served as Senator between 1969 and 1981. In September 1976, after two years as volunteer engineer for KNOM, Mark Hoelsken boarded a plane for the Lower 48. No one, including Mark, imagined that he would be ordained a Jesuit priest, and in 1998 become KNOM’s spiritual director. SUITABLY: General manager Ric Schmidt’s usual garb is blue jeans and a golf shirt, but twice this summer, he suited up. He’s president of the Alaska Broadcasters Association, which flew him 539 miles to the “big” city of Anchorage to host special dinners. The first event was with National Association of Broadcasters’ CEO David Rehr, and the second with Federal Communications Commissioner Robert McDowell. Ric ably officiated. WILLFULLY: Please consider adding the KNOM mission to your will. For most of us, it is the largest contribution we will ever make. We prayerfully place all bequests into funds that provide for future emergencies and major improvements. LIFE CAN BE HARD in rural Alaska. The nearest highway is a $400 to $600 airplane ticket away. It’s bitterly cold much of the year, with storms, snowdrifts and darkness during the winter and long periods of fog in summer. You have to manage without luxuries. 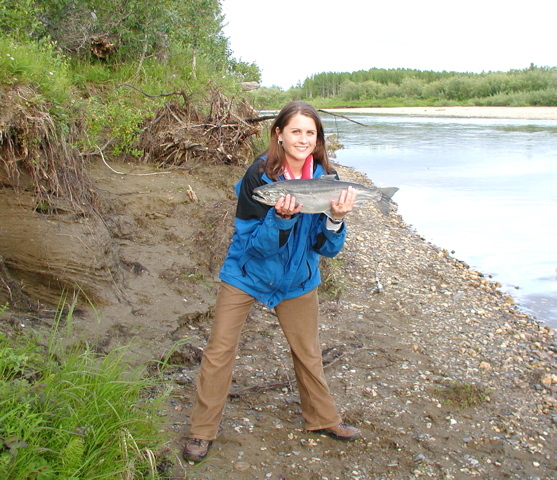 But, left, KNOM’s Amy Flaherty demonstrates that there is at least one perk you can enjoy when you live in western Alaska. 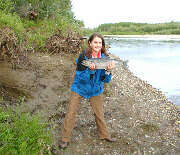 Amy hooked this beautiful silver salmon from the Niukluk (NYUK-luk) River, about 60 miles northeast of Nome. INSPIRATIONAL SPOT: In God’s kingdom, the only way up is down. To become great in His kingdom, become the least, the servant of all. 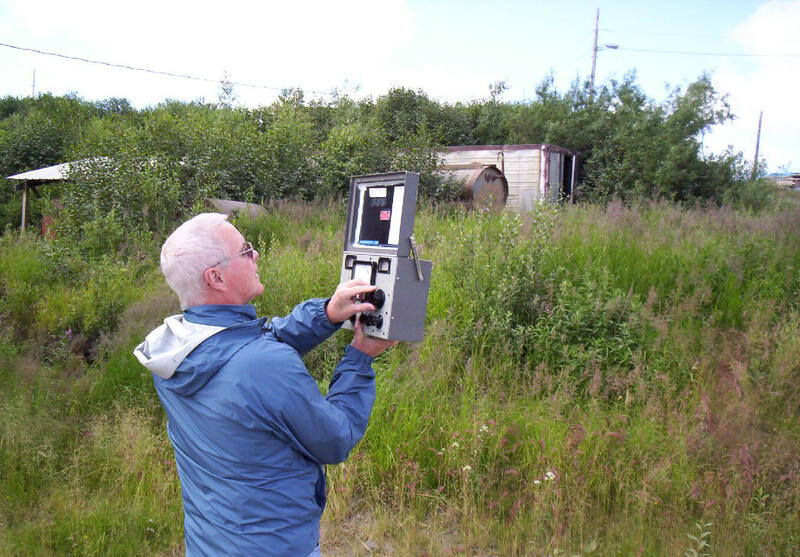 FOR GOOD MEASURE: (left) 180 miles SSE of Nome in the village of St. Marys, KNOM financial officer and engineer Tom Busch measures KNOM’s signal strength outside Church of the Nativity parish. It’s one of thirteen which KNOM has planned for over two years. Originally, we expected to feed our signal to these remote villages via AT&T circuits, but discovered that doing so would cost over $100,000 a year. Although St. Marys is relatively close to Nome, KNOM’s signal is partially blocked by a series of 800-foot hills a dozen miles north of the village. By the time you receive this, we hope that the St. Marys translator will be up and running, with more to come. Please stay tuned! AFFAIRS: Public affairs programs on KNOM this past month included interviews with gubernatorial and Lieutenant Governor candidates in Alaska’s primary election. 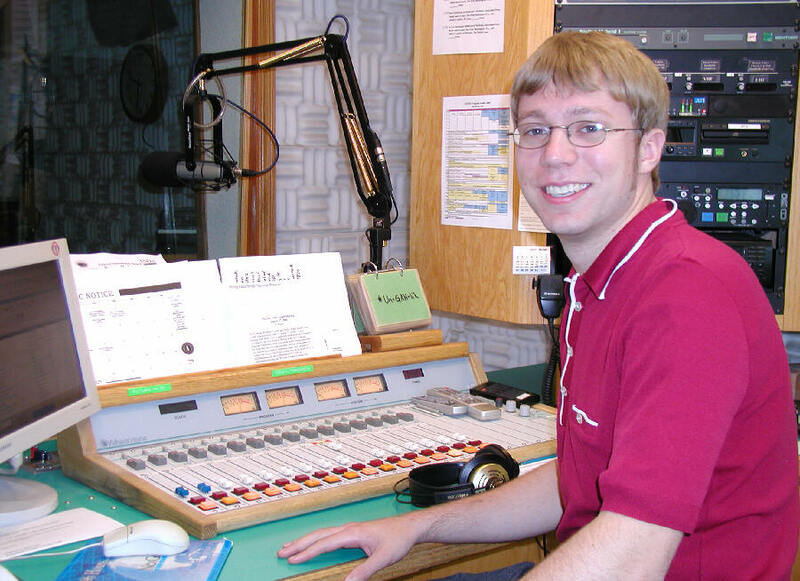 For most KNOM listeners, it was the only way to learn of their stands on vital rural issues. We touched on youth subjects around the Arctic, such as the alarming child suicide rate among northern peoples. Miss World Eskimo-Indian Olympics, Gussie Ivanoff, reflected on her year with the crown as an outreach toward young people, providing a strong, intellectual culturally-minded role model. Experts discussed reindeer herding with a cultural focus. Mining, and the risks it might pose to the environment, was a subject that received a lot of air time, among dozens of topics. Thank you for making these important discussions possible! SPOT CHECK: Since January, KNOM has broadcast approximately 25,500 inspirational spots, including the ones on these pages. During the same period, we aired another 25,500 educational spots, dealing with food care, sanitation, alcohol and drug abuse, health, safety, educational opportunities, and many other issues of crucial importance to the isolated people of western Alaska. THANK YOU once more, for your generous help and especially for your prayers. Without you, our mission would quickly cease to exist. We pray that Our Almighty Father rewards you a thousand fold for your kindness. May He bless you abundantly! Copyright © 2006 KNOM. All rights reserved.